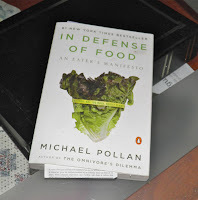 I’m reading a very interesting book called In Defense of Food, by Michael Pollan. 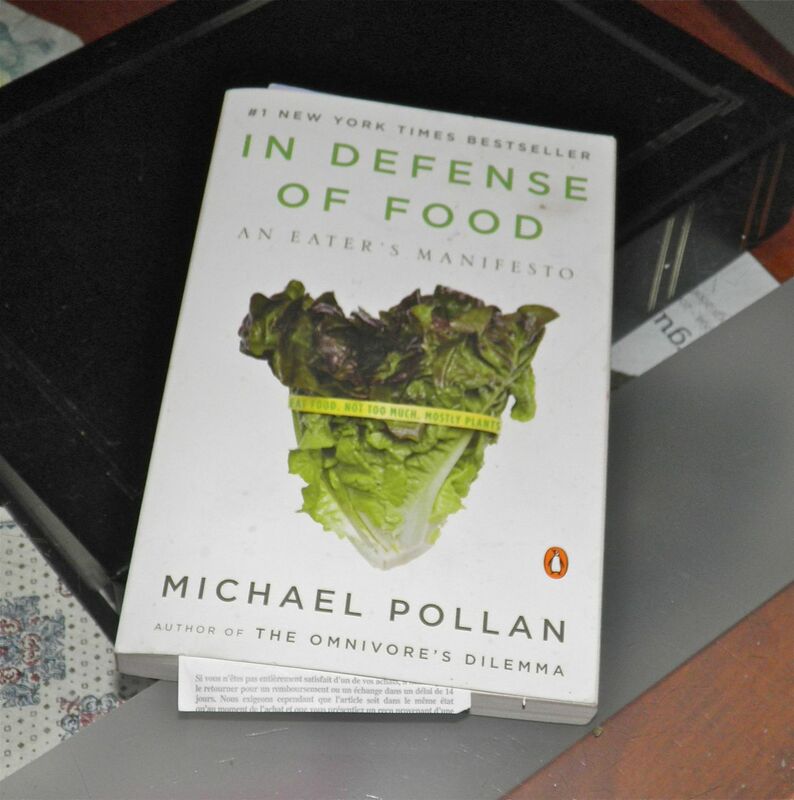 In it he outlines how over the last many decades our dietary habits have been shifted from consuming food to consuming “nutrients.” By that he means foodstuffs that have been engineered or chemically combined to have a perceived benefit. He also makes a strong case that the prevalence of disease in the Western world is due to this engineering. His belief is that there is a correlation between our ingestion of altered foods that do not have all the vitamins, minerals, etc., that naturally grown foods possess and chronic illness. Data does show that disease occurrence has risen as our use of prepared foods has increased. First eat a better, more balanced diet with a higher fruit and vegetable content. Eschew the prepared foods section of your grocery, or better yet eschew the grocery as much as you can for your local farmers market. Make your own food at home, you know — like your grandmother did and her mother before her. Delicious, healthy and filling. Perfect for four hungry people. Look back to recipes that warmed your heart as well as your stomach. Don’t obsess over fat and carbs and the like. Eat a balanced meal full of all the nutrients your body needs. You’ll be better for it. Here’s a time worn recipe from the north coast of Scotland; a place called “Cullen” if you can imagine. 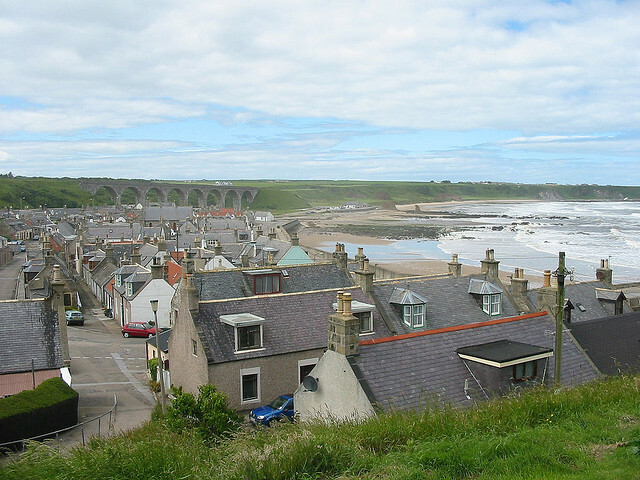 Cullen is a small town in Scotland and the home of one that country’s most famous dishes, Cullen Skink. It is a hearty soup and traditionally made with smoked haddock, potatoes and onions. I have seen recipes that include corn as well, but I believe that is not part of the traditional ingredient list. This is my version, which is a hybrid of the classic and a smoked haddock recipe that my mother still makes for me on a fairly regular basis. Her recipe is a wonderful memory of home. She's going to love this when I make it for her. Maybe this recipe, and ones like it, will be the start of some heartwarming memories in your family too. Once the eggs are in don't stir it or you'll break them up. Essentially you're poaching them in the chowder. Render the bacon in a large, deep stock pot. Add the leeks and cook on medium until they become softened, about 5 minutes. Remove the leeks and bacon from the pot and reserve. Add the diced potatoes, thyme and cup of water. Cook on medium for 10 minutes until the potatoes are soft. Do not let dry out or stick to the bottom of the pot. 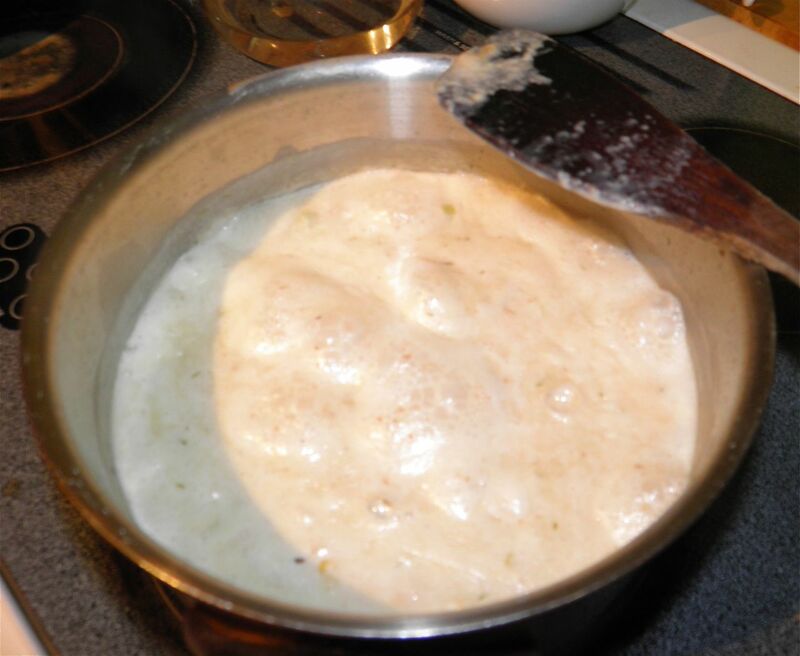 Mash the potatoes and remaining water together in the pot. Pour the milk into the mashed potatoes, add the leeks and bacon, and mix well. Bring to a simmer and add the haddock and 1 tsp of pepper. Add the corn, if using. Let cook for 3 minutes. Taste for salt. Crack the eggs and drop whole onto the surface of the chowder. Do not stir unless you're really concerned about the chowder sticking to the bottom. If you do stir, do so very gently so as not to break up the eggs. Let the eggs poach until cooked, a further 4-5 minutes. 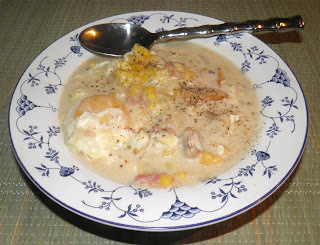 Serve each bowl of chowder with one of the eggs and sprinkle with parsley if desired.